Somehow in my series on culinary herbs and how to use them in cocktails, I left out one of the best known and most widely herbs: basil. You would think that an herb with a nearly 4000 year history (mentioned first by the ancient Egyptians and used an an embalming herb) and whose Latin name Ocimum basilicum references a Greek warrior and the Greek word for “king” would have been first on my list. It is my favorite herb! 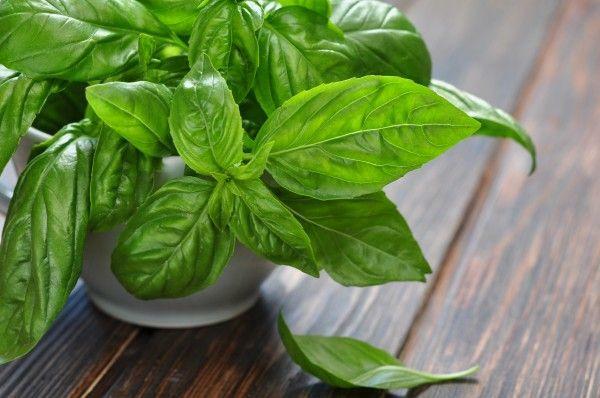 Basil is known in India (by the name Tulsi or Toolsi) as a holy herb. 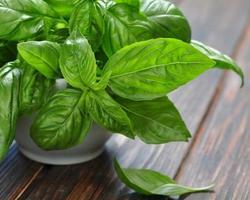 Hindus believe that basil is sacred to all the gods and acts as a protector. It is often planted around temples and cemeteries. Other cultures view basil as a love token or even as a protector against evil. Oddly enough, through much of history, basil was thought to be poisonous and a symbol of poverty, hate, or abuse. Victorians, in their love of floral symbolism, categorize basil as representing both hatred and best wishes. 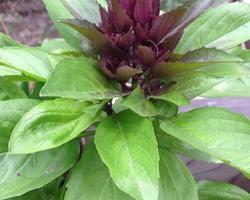 The numerous modern cultivars of basil include scented basils like cinnamon, lime, licorice, and lemon. 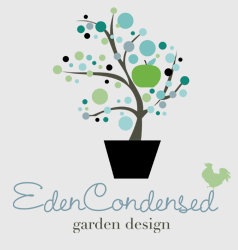 Other varieties include Thai basil, lettuce leaf basil, Genovese basil, amethyst basil, and Christmas basil. 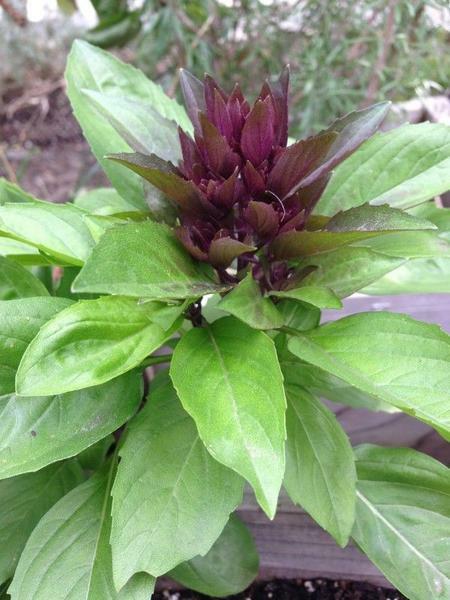 One of my favorites that I grow in my garden is Cardinal basil. It is slightly spicy and branches out to about 3 feet. At the end of each branch, the plant flowers into beautiful red ruffled flowers. Basil flowers are edible and attract beneficial insects, but to keep the plant from turning bitter or getting too leggy, it’s best to pinch off most of the flowers. Basil is a warm season herb and will die back pretty quickly once the weather turns cold. However, it also makes a great indoor herb, which is easy to grow from seed in a sunny window. Basil is obviously well known in Italian food. Caprese sandwiches, Margarita pizzas, and pesto come immediately to mind. Basil is also common in the food of Vietnam, Thailand, India, and the Middle East. 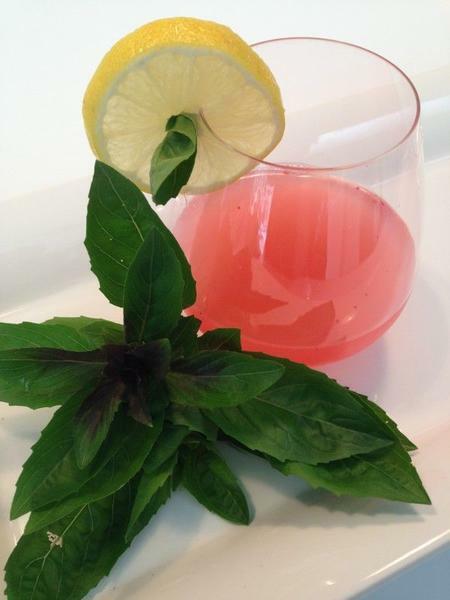 Basil is also adds brightness and depth of flavor to fruity cocktails. Drinks that include lemons, limes, strawberries, tomatoes, or raspberries really perk up when basil is added. 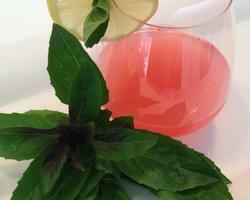 So for your drinking pleasure, I am sharing my raspberry basil lemonade. You can make it by the pitcher, so it’s perfect for a party. You can use strawberries if you don’t have raspberries. You can even spike it up with some vodka or sparkling wine. Any way it’s delicious, so enjoy! Just remember to sip responsibly. In a small saucepan, combine sugar and 1 cup water. Bring to a boil to dissolve the sugar. Cool to room temperature, then cover and refrigerate until cold. In a pitcher, combine the sugar syrup, lemon juice, 7 cups of water, raspberries, and basil. Stir well and chill for at least 4 hours. Serve over ice with a lemon slice and a basil leaf as garnish. Serves 10. For an adult version, add 1 cup of vodka OR 1 1/2 cups of sparkling wine to the mix before chilling.